Who I Am, What’s This About, Anyway? Hello, and welcome to my blog/website/whatever-this-morphs-into. I appreciate you stopping by! I sent my first book to a publisher when I was nine years old. The title: The Poor Macaroni Named Joany. It’s goofy story (elbow macaroni characters who talk, make friends with storekeepers, and are reincarnated as noodles), but a wonderful and encouraging art teacher named Mrs. Carr urged me to submit it for publication, and so I did. Mom typed up the words on our manual typewriter, I carefully created drawings in pen and India ink. The result? I received my first official rejection letter from a publisher at age nine. Sigh. 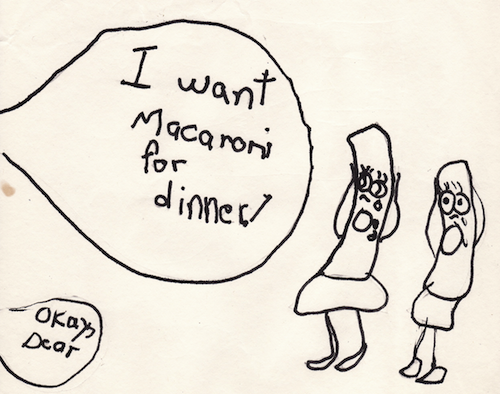 Actual art from The Poor Macaroni Named Joany by Cal, age 9. Because I’m a glutton for punishment—or simply don’t know better—I tried fiction again. This time it was a children’s book about a girl, a wishing well, and time travel. It was, in a word, terrible. Yet I still couldn’t kill the dream that someday I would, could, had to, write a book. One that would actually get published. But I needed help. So I went off to graduate school at the University of Southern Maine, the Stonecoast MFA program, where I had my writing trashed and encouraged in equal parts by mentors and peers. Sometimes I hated the process, more often I loved it, and ultimately, I survived and learned. Fast forward to today, and finally (wait for it—I want to savor these words): I am about to become a published author. The official launch date of my young adult novel, Being Henry David, (publisher: Albert Whitman & Company), is March 1, 2013. That makes it almost nine months away. (The countdown is on–check the update near the top of this page!) Kind of like a pregnancy, even though the book-to-be is already a full-term manuscript. Now to prepare for its long-awaited arrival. There’s absolutely no way I can pretend not to be thrilled about this. I am just not cool enough. It’s winning the lottery, falling in love, finishing a triathlon, climbing Mount Everest. It’s a lifelong dream come true, and my heart is full. I welcome you to stop in to visit from time to time, to read my blog and hear about my journey. If you’re interested, it would be my honor to share it with you.